Alec Burks, Grandview High School alumnus, and National Basketball Association star for the Utah Jazz, will receive a proclamation on Tuesday, November 22, at 7:00 p.m. in the Grandview City Hall during the Board of Aldermen meeting, declaring Wednesday, November 23, as “Alec Burks Day”. The proclamation will be presented to Burks for his outstanding athletic accomplishments in basketball. Burks was recently selected by the Utah Jazz in the first round (12th overall) of the National Basketball Association 2011 Draft, thus becoming the first Grandview High School athlete to ever play in the NBA. During his years at Grandview High School, he was named the 2009 Gatorade Player of the Year in the State of Missouri as a senior, while averaging 23.0 points, 6.8 rebounds, 3.0 assists and 1.6 steals per game. Burks scored 33 points and had 13 rebounds while leading Grandview to runner-up in the Missouri Class 5A state championships; He also named the Kansas City Star and Metro Sports Player of the Year as the top player in the Kansas City metro area; In addition, he earned First Team All-Suburban Six League honors. 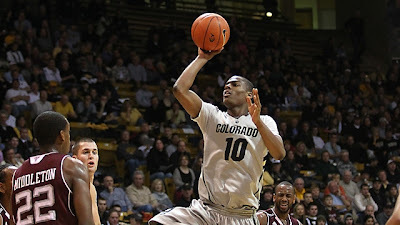 During his two seasons as a guard at the University of Colorado, Burks also broke numerous school records, including most points scored in a single season (779), most points scored by a sophomore (779), most points scored in a season by a guard (779), most free throws made in a season (249), most free throw attempts in a season (302) and first player with at least 500 points (779), 200 rebounds (247), 100 assists (112) in a single season. Burks earned honorable mention 2010 – 2011 All-America honors from the Associated Press. He was awarded Andy Katz National Player of the Week for the week of February 21, 2011 to February 27, 2011. He was named to the Big XII Conference First Team and to the National Invitational Tournament All-Tournament Team. He was a Top-20 list finalist for the John R. Wooden Award. He was also part of the Lute Olson All-American Team, Big 12 Basketball Championships All-Tournament Team, and was named Big XII Conference 2009 – 2010 Freshman of the Year.